The players carefully select two path cards from their hand and try to outwit the other players. The person with the lowest sum loses a card. They then use the cards to create a network of pathways to connect their adventurers with the temples. Who will best guide their adventurers through the jungle? At the end the winner is the player who collects the most points with valuable treasure and temples. Contents: 96 game cards (16 cards per player), 1 overview tableau, 1 set of instructions. Short game instructions: • Shuffle well deck of cards of each player. Draw three cards into your hand. • SELECT CARDS: Select two playing cards from your hand and lay them face-down. Turn over at the same time all the calls that were laid down. The player with the lowest number total of the playing cards must discard one card. • LAY DOWN CARDS: Lay down playing cards in a grid of a maximum of 4 x 4 cards. Don’t turn cards; always lay cards side to side. 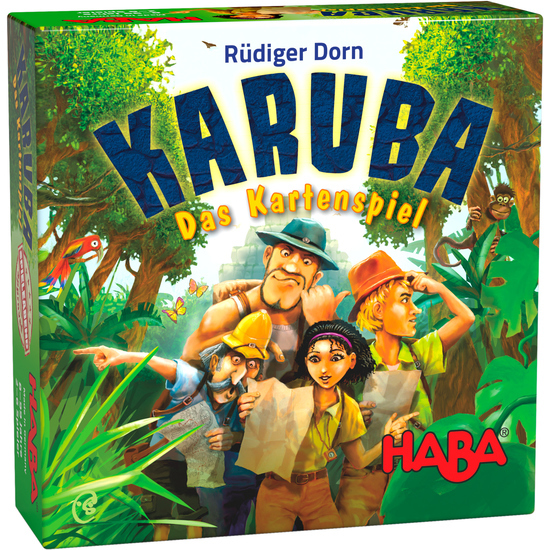 In doing so, connect explorers and temples with paths. • DRAW MORE CARDS: Draw 3 more cards into your hand. • After round 8, score paths between explorers and temples and collected gold nuggets/crystals. The player with the most points wins.